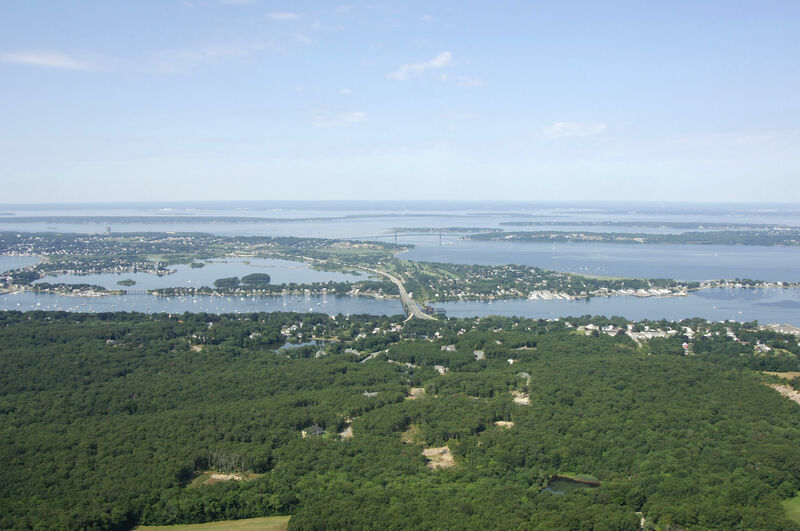 The Sakonnet River leads down behind the Aquidneck Island and forms the third sliver of north-south running water in the Newport area. Starting out at Mount Hope Bay to the north, and finally emptying into the Atlantic Ocean at Sakonnet Point, the Sakonnet River is approximately 13 miles long from end to end. Along its length you will find a variety of marine facilities, and a good number of them cater to transient guests. In the Town of Tiverton there is a unique little harbor of refuge bounded by two bridges to the north and an unusual storm barriers to the south. 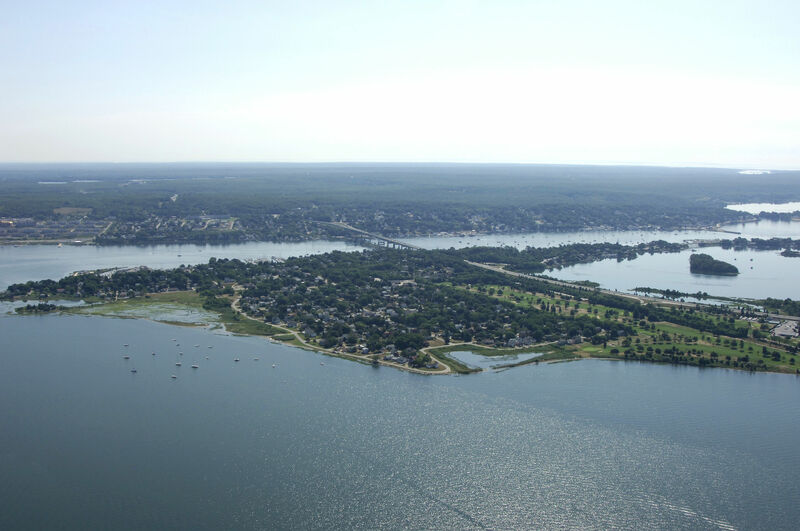 Tiverton was originally incorporated in 1694, as part of the Massachusetts Bay Colony. A long boundary dispute between Rhode Island and Massachusetts was settled in 1746, and Tiverton, by Royal Decree, together with the Towns of Cumberland, Barrington, Bristol and Little Compton was annexed to Rhode Island. The town was incorporated in 1747. For approximately three years during the Revolution when the British held Aquidneck Island, Tiverton was an asylum for Americans fleeing from British occupation, and the town became a mustering point for Colonial forces who gathered together to drive the British off the island. In its early day, Tiverton was chiefly a farming community with some fishing and boat construction. Until 1900 the manufacture of menhaden oil, a fish derivative, was one of the primary industrial pursuits. Cotton and woolen mills were established as early as 1827.
oday, trade establishments are the major employers in the town. Recent years have seen Tiverton grow as a summer resort and residential area. Development hes been concentrated in the area known as North Tiverton. From Mount Hope Bay, exit the main channel at red and green buoy MH (flashing red 2+1) and head to the east toward green can 3 and flashing red bell buoy 4 at Common Fence Point. Once you have cleared Common Fence Point, chart a course for green can 17, and then the center span of the fixed (65-foot clearance) and swing (12-foot closed clearance, opens on demand) bridges at the Hummocks. Before the bridges are two marinas, one to the east, and one to the west in Cedar Island Pond. Only the facility on the east shore accepts transients. Inside the protected area between the bridges and the protected storm wall at Tiverton are four additional marinas and a field of moorings. Keep in mind that the current here is quite strong, and the maneuvering room is slim in quite a few places. 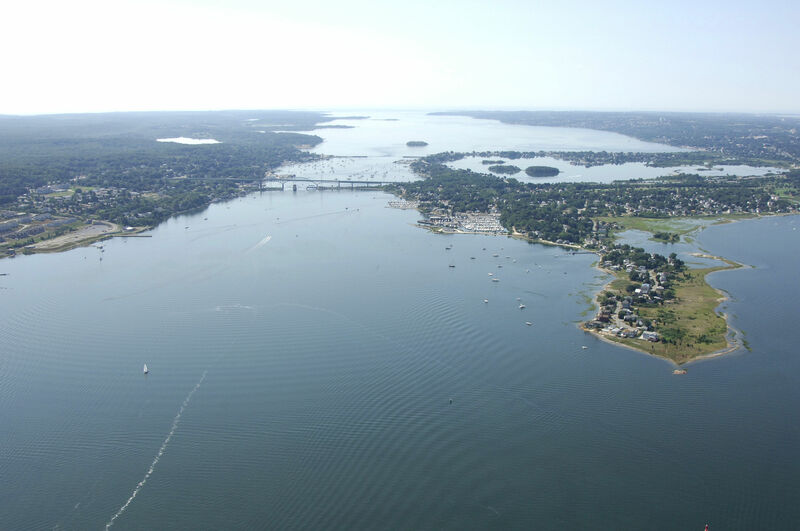 With good depths throughout you should encounter no draft issues, but several boats each year temporarily loose control of their boats here due to their lack of attention toward the current flow. No reviews yet! 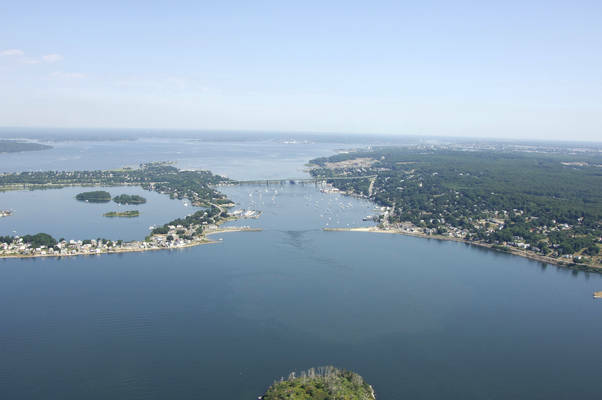 Be the first to write a review of Tiverton Harbor.